Vivian Hartley Church Abbott was the eldest son of David Charles Abbott and Charlotte Elizabeth Abbott. Vivian was born in Fivemiletown on 5th October 1881. The 1901 census lists Vivian as age 19, living at Military Barracks at The Curragh, Kildare. Vivian Abbott served for one year with the South African Army and fought in the Boer War. Vivian and his wife Eleanor Abbott emigrated to Canada. On enlisting, his wife was living in Mission City, British Columbia. Vivian Abbott was working as a surveyor's chainman when he enlisted on 15th June 1916 in Vancouver, British Columbia. 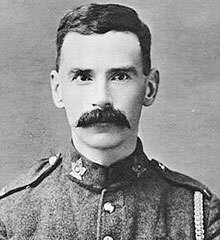 Private Vivian Abbott was serving with the ‘D’ Company, 29th Battalion of the Canadian Infantry when he was killed in action during the battle for Hill 70 at Lens on 21 August 1917. He was 36 years old.